Pirate skirmish games are quite popular at the moment. I think Freebooter's Fate had something to do with that, because they helped to reboot pirate skirmish game genre recently world-wide. There's also another Pirates of the Caribbean feature film in the works, so even Captain Jack Sparrow will be back soon to entertain us all. As it stands, it looks like pirates and the swashbuckling pirate-genre skirmish games are here to stay. I wouldn't want it any other way. 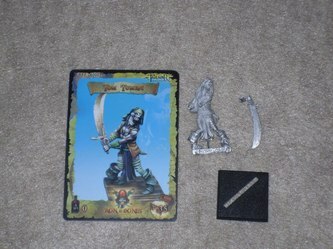 Tale of War is a company out of Spain, and they're responsible for the pirate skirmish board game Ron & Bones. The Ron & Bones skirmish board game has been around since 2008, but it seems to be more of a hit overseas in Europe, as it never gained much ground here in North America. It's not like they didn't try, because they did offer an English version of their boxed set, complete with an English rulebook. The problem is that the translation was terrible, making it very hard to learn the game with that English rulebook. That's the bad news. 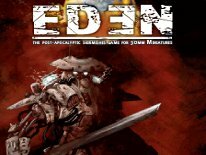 The good news is that at present they've sold off all the remaining original Spanish/English language boxed sets, and they're hard at work creating an all new boxed/starter set for Ron & Bones with an all new English rulebook, and an all new assortment of models. Once that's ready I'll take an in-depth look at the game of Ron & Bones. One thing has never been in question...the models for Ron & Bones are absolutely amazing, and are worth reviewing stand alone as miniature models, which is exactly what I'm here to do today. 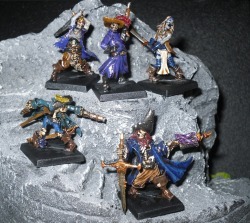 There's one thing that Ron & Bones has, which Freebooter's Fate doesn't, and that's undead/skeleton Pirates. I'm here today to take a look at a variety of the undead/skeleton pirate models for Ron & Bones, from Tale of War. 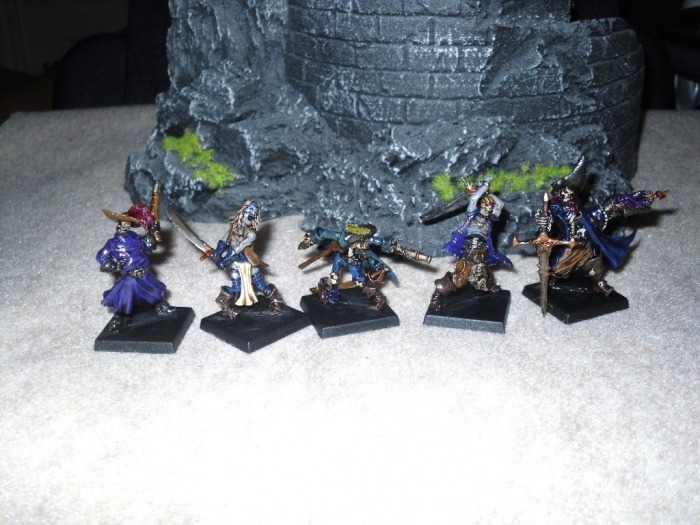 The models themselves for Ron & Bones are a little larger than 28mm heroic scale models too. So you could use these in other game systems, but when put next to Freebooter's Fate, and other 28mm scale pirate models they tend to look a little taller and thicker. These are also all metal models, cast in white metal. This is a 4-piece model. The gun, sword and a third piece resembling a braided pony tail make up the separate pieces included. My only problem with this model is that there's a nub on the left arm to attach the wrist holding the gun. However, on the wrist holding the gun there's no socket! This looks like a miscast piece to me, because instead of a socket, a big piece of metal was sticking out from it. I had to hack the piece off, and then use my pin vice to hollow out a socket that would accommodate the nub. Thankfully the entire process didn't take but a few minutes, but if someone didn't have a pin-vice or a drill handy, that might not have been such an easy fix. The sword is held by a hand that ends at the wrist. This attaches to the right cuff of the jacket that's hollowed out like a socket. There's not really enough wrist to allow the cuff much to grab onto. I probably should have pinned it, but instead I used a thicker CA to fill in the space left behind the wrist. I also never did find out where the tiny little braided piece goes. As for clean up, there was minimal mold lines, and minor flash bits. The sculpt itself is rather attractive. I love that there's a tiny squid sitting atop of the pistol, and shooting out of the pistol appears to be a wraith of some sort. He also comes with a 25mm square slotted base. The pose is also nice, and the entire piece has a very animated, almost Disney-esq look. The detail on the sword, the bones, even the boot cuffs are quite nice too. There's certainly nothing to complain about visually once the model is assembled. 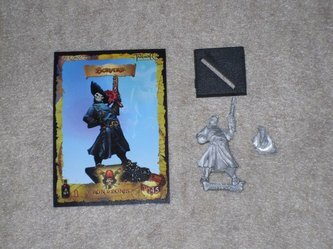 He appears to be a captain in the game, and he's priced at about $18 USD. 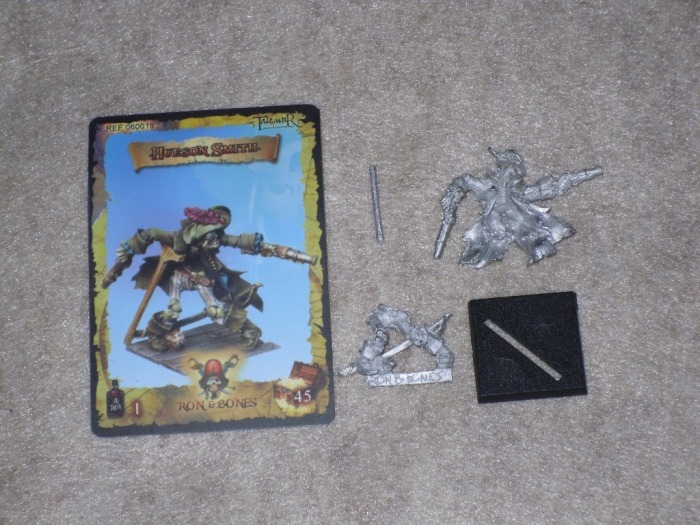 He's also rather tall and is one of the largest undead skeleton pirates in the range. He's definitely competitively priced with Freebooter's Fate models. Here's a unique fella. This is a 3-piece model. The stick from the crutch is separate, and the body is separated into two pieces. The only problem I had with this piece was figuring out just where, or how the upper torso was to be bound to the lower torso. There's no visual cues even hinting around to how the top is supposed to be bound to the lower half of the body. So I went with the only way that seemed possible. I probably should have just pinned him too. Aside from gluing the upper to the lower torso, the only other part to attach was the stick for the crutch. 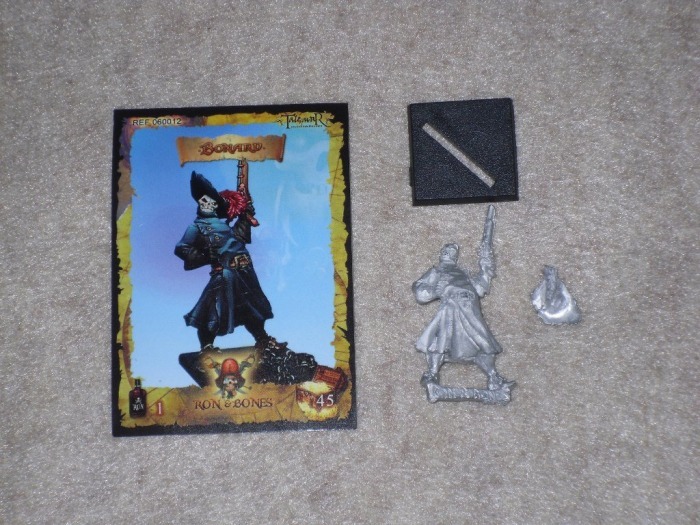 This is another really nice looking skeleton/undead pirate model. He's wielding dual pistols, his sword is dangling almost at his ankles, as he balances on a crutch. There's a tiny little squid hiding behind the inside of his right boot too. He's another Disney-esq looking model, and I really can't find much to complain about once assembled. Only minor mold lines existed, so clean up was a breeze, and he too comes with a 25mm square slotted base. 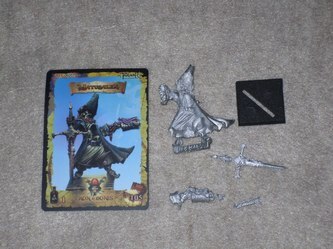 He sells for roughly $13 USD, which also puts him right in line with Freebooter's Fate pricing. This guy is sorta skeleton-looking, but zombie-looking as well. I don't know what to call this one. He has the skull-like face of a skeleton, but there's flesh left on the bones elsewhere, leading me to believe he's more undead zombie than true skeleton pirate. He's also standing there in a shambling, almost pigeon-toed stance holding his sword with both hands. Tom was what I thought would be a simple 2-piece model to build. The problem is that the sword comes with both hands attached already, and you have to simply glue the wrist bits to the socket-like end of the wrists on the arms. Well I had to bend the sword a little, and it snapped right off right where both hands meet clutching the sword. This is another 2-piece model, and aside from a minor mold line, and a couple of tiny flash bits, he went together quite easy. This model is pretty much ready to go as a single piece casting, only the hat with the feather on it is a separate piece. You could go without the hat if you wanted too, but I opted to use it and glued it on. He has a somewhat cocky look about him, and I like that. It might even be confident more than cocky, either way he's standing there pistol pointed towards the sky, ready for action. Like the rest, he looks the part for being undead, but he's not scary-looking undead. He too comes with a 25mm square slotted base, and he sells for roughly $13 USD. Lastly we have Bill. He too has a lot of character. I like the little skulls hanging off him, he's also quite tall, and he's posed to strike with his sword pulled back over his head with both hands. He was another 2-piece model. The only piece you need to glue is the sword with both hands already on it, to the sockets on the wrists at the end of the arms. This went without a hitch, as the nubs on the ends of the hands fit nicely into the sockets on the ends of the wrists. He's also quite tall, and he fits right in with the rest of this scurvy band of undead skeleton types. 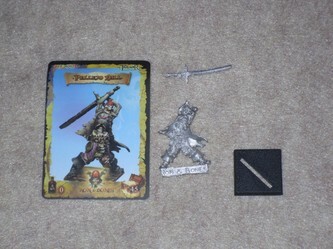 Also like the rest, he also comes with a 25mm square slotted base, and he sells for roughly $14 USD. I've always liked these models based on the pictures I saw of them online. Now that I've seen them up close and personal, I like them even more. I really enjoy the Disney-esq, almost animated look and feel of the models. These aren't scary undead/skeleton pirates, they're entertaining undead/skeleton pirates. 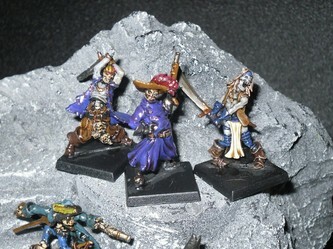 They have that tongue in cheek, and cartoon character-like look about them, just like Freebooter's Fate models. Technically Ron & Bones was out first, so Freebooter's Fate may very well have borrowed their look from Ron & Bones, because they both have that animated and Disney-esq look. My only real complaint would be how some of the models are assembled. The miscast piece is probably a mistake, so I won't hold that against them. I can deal with that. They could still use a little work in the assembly department with some of the others models, especially Mr Smith. Thankfully none of the issues I had were showstoppers. 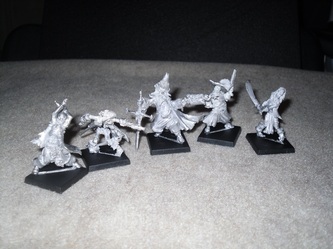 In comparison these are also larger models than Freebooter's Fate models, and other 28mm-30mm scale models out there. For instance from the bottom of the base, to the tip top of his hat Matusalen is 51mm tall. If I measure from the top of the base to his eyes, then he's 38mm tall. Pellejo Bill is roughly 35mm from top of the base to his eyes, and 38mm tall to the top of his head. Even the crouched down Mr Smith is 32mm tall from top of his base to the top of his head, and he's the shortest model of the bunch. 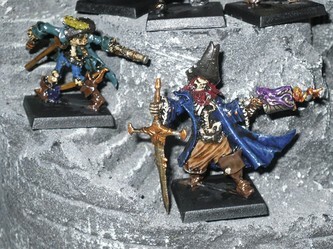 Only the very tallest Freebooter's Fate models I have are 35mm tall from top of the base to the top of the head. Although I have to say, that the Ron & Bones models don't look that bad on a table next to Freebooter's Fate models. 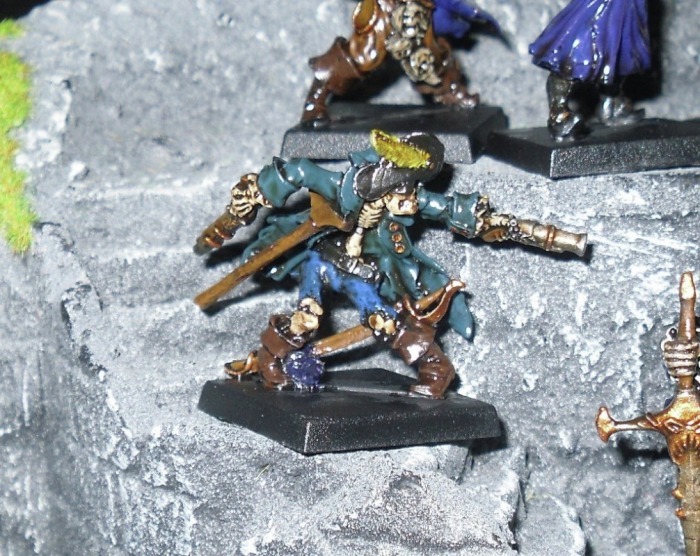 All of those numbers above look to show a difference on paper, but in reality only Matusalen really stands out like a sore thumb next to the Freebooter's Fate models. Actually he's so large that he even stands out among the Ron & Bones models. 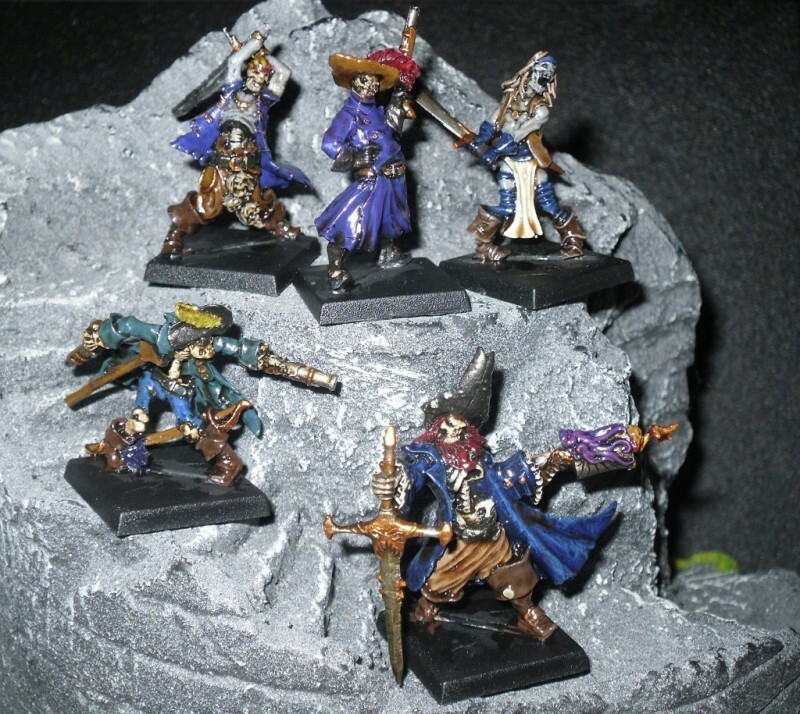 If you take into account these are larger than Freebooter's Fate models, and they're priced nearly the same, the Ron & Bones models are then priced quite reasonably. Some might say they're a better value since being bigger means you're getting more metal for the same money. If you're a collector of pirate models, these are must have models. Since I'm yet to play the game of Ron & Bones I can't yet comment on their usefulness in the game, but rest assured, I'll be taking a look at Ron & Bones the game once the new boxed set and new English rules are released. As it stands, these truly are the nicest undead/skeleton pirates that I've seen yet first-hand. 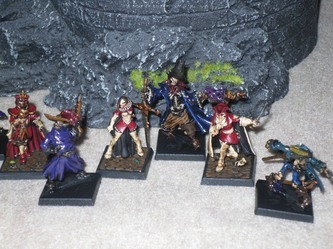 I've only covered a handful of the Ron & Bones models too. There's close to 30 models available at present, and more to come, because they seem to release new models on a monthly bases. Check out their website below for more on Ron & Bones, and the other models Tale of War has to offer. Also stay tuned for my review of Ron & Bones once the new starter set is available.